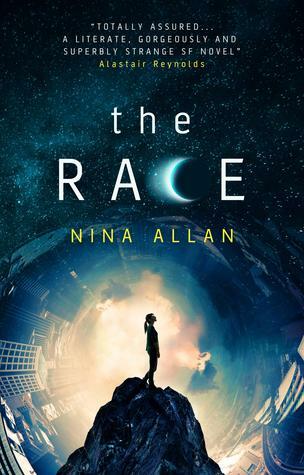 My next installment in the Women’s Book March challenge is The Race, by Nina Allan. I have mixed feelings about this one. I’ve had The Race on my to-read list for a while, in part because it was praised by one of my favorite sci-fi authors, Alastair Reynolds, who called it “a gorgeously and superbly strange SF novel”. Another blurb promised a blend of “English country novel and hard science fiction”, which is a pretty intriguing mashup. The first section of the book starts strong, delivering a story about a near-future England ravaged by fracking. Racing illegally genetically enhanced greyhounds, called smartdogs, is big business for the former resort towns of the English coast. One such town is Sapphire, where Jenna and her brother Derek live and breathe smartdog racing until Derek’s daughter is kidnapped and held for ransom. Derek plans to win the ransom money by racing his beloved smartdog in the biggest race of the year, but things don’t go as planned. This first section was taut and gripping, with gorgeous prose and characters who are flawed in relatable ways. There’s enough worldbuilding to sell the smartdog racing idea without bogging the story down, and the ending has a great twist. I say ending because after the first section, Jenna’s story ends and the novel becomes something else. In the next section we are introduced to Christy, a woman who lives in fear of her abusive brother and is grappling with the possibility he may have committed a murder. It’s still set in England, but not the same England as Jenna’s story; in fact, all elements of science fiction vanish from the tale for about 200 pages, and what we get instead is more like a suspense novel. It’s only in the fourth section that we return to something like the world of Jenna’s story, this time to follow the kidnapped girl, Maree. Now a young woman, Maree is learning to use her empathic abilities as part of a government project trying to decode what may or may not be an alien signal from outer space. Unfortunately, what could have been an interesting conclusion to the book sort of fizzles. We don’t get any answers about the origin or nature of the signal, and as a result the novel’s end feels more like setup for its sort-of sequel, The Rift. My ultimate issue with The Race is a matter of concept versus execution. Nina Allan clearly has writing chops and a lot of interesting ideas, but the story is not disciplined in how it deploys those ideas. At times it felt as though Allan included an idea or storyline not because it served the story but because she couldn’t bear to cut it. This was especially true of the “suspense novel” section of the book, which could easily have stood on its own as a separate short novel. The Race shows enough promise that I would be interested in returning to this author after she has a few more novels under her belt, and has perhaps become more disciplined about story structure. There’s still enough good stuff here, especially in the first story, that I’d suggest checking it out if you’re still interested. Your mileage may vary, and if the book had been marketed as a series of linked novellas rather than one novel, I probably would have enjoyed the whole much more. Already read The Race? Let me know what you thought in the comments below! This entry was posted in Articles, Book Reviews, books, science fiction, Women's Book March Challenge and tagged biology, books, science fiction, women authors. Bookmark the permalink.